Thread: Have you had this problem? Several months ago I bought an inexpensive Brother machine to replace my dying old Pfaff. It took me a while to like the new one at all, but it turned out the upper tension inside the machine is off, so compensating for that helped. The only problem I cannot seem to get over is the bobbin take-up. A technician at my LQS showed me what the bobbin area should look like, how the thread end should cross over the inserted bobbin and then come up thru the plate. (Please forgive if these are not the right words.) When I need to insert a new bobbin I often have to take it back out and try over and over again, sometimes a dozen times, before it [the thread end] stays in the right place long enough to sew. And then it sometimes slips "out" in the middle of a seam, at which point it begins that looping nonsense on the underside. Long, long story to this point, but the question is: Have you had this problem, and have you found a "cure"? Where did you purchase the machine? If you got it from Walmart's, I'd say take it back and get a new one. Tell them that this one does not stitch correctly and the bobbin thread does not work properly. Do you have your receipt? Take it back to where ever you got it and exchange it for another. Sounds like you got a lemon! Unfortunately, the inexpensive Brother/Singer machines that you can buy off the shelf at a store like Walmart are not designed to last long, nor will they tolerate what an avid quilter will ask of them. I've had two Brothers, both purchased from Walmart and neither lasted long - the most recent was a cs600i and it only took two years of sewing before it crashed with the repairs costing more than the original purchase price. The more expensive Brothers are said to be of better quality, I myself can't say as my current machine is a Janome 6600. I am not sure of the warranty, but try to take the machine back and get a refund. You will be much happier with a better quality machine. I guess it depends on what you mean by inexpensive. I have never had this trouble with my Brothers. Is there a diagram showing you which way to load in the bobbin? That should be a two second job. Something doesn't sound right there. Just drop it in - let the 4" piece of thread lay aside... bring down your upper thread by rolling the hand wheel enough that it takes up the bobbin thread. Run your pencil, ripper, anything front to back through those threads and that should send both thread ends to the back of the machine. You should be ready to sew. Or maybe I just can't understand what the trouble is with the thread/bobbin. Can you take a picture of the problem and post that here? I have a ULT Brother with the Disney caratures built in, a 9000 Janome and a SQ=9000 I got at Walmart. Have had no problems with any of them. The SQ-9000 I've had for 2 years and can't believe for the price how well it sews. I've made about 6 or 7 quilts with it and it sews like the bigger ones do. Guess it depends on if you get a good one or a lemon. With the price I paid for the SQ I could afford to buy another one if it gives out. It is lots easier to take to classes. That 's why I have it. I got a pretty decent picture of the CORRECT way this should look, and hope I can upload it. This machine has a drop-in bobbin with a very primitive (simple) laying down of the tail. My issue seems to be when the needle & top thread come down to grab it, do they grab it right. (The Tech. at the store did say this was related to the top tension, so maybe I will have to spend the $ to get that fixed.) I was always taught to have both threads "up" before starting to sew, so I pull the wheel toward me to draw the bobbin thread up, before beginning. I bought it reconditioned off the internet. It is one of those Project Runway machines with 80 built-in stitches. I haven't given up on it yet; it may still be one underlying problem in the machine and massive user ignorance. Looking at your picture, the bobbin loads like mine. You do not have to pull the bobbin thread to the top. You just wrap it around the way the directions show, with the thread going the correct direction and cut it at the end with the built in cutter. I use a starter piece to eliminate the bunching of the thread when I begin sewing. Well, I bought a Brothers NX-250 which I do not consider inexpensive. I too have had that problem. I have found that both times the looping on the back has happened, I had to take everything apart and there was something down inside that was making it act up. 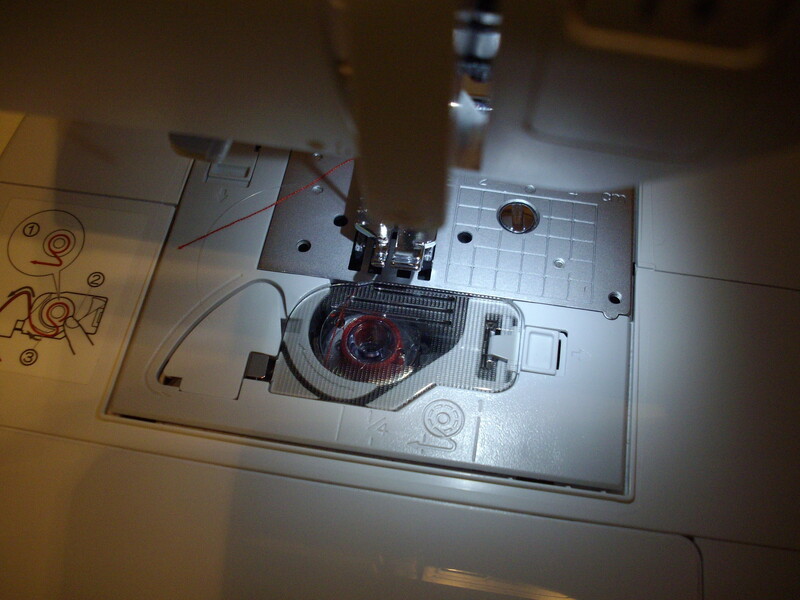 I love this machine and it sews nicely. This machine is two years old but I haven't used it very much and still trying to get used to it. Both times it acted up, I rethreaded, new needle, all the usual things. Nothing worked. Then when I took it apart I found either a piece of material or a piece of a pin somplace around the bobbin case. Once that was cleared out it worked fine. One of my Brother machines threads exactly as yours does. As long as you lay the bobbin with the thread coming off correctly, and pull it through the end with the built-in cutter, it should work fine. I don't pull both threads up before sewing. When I have had problems with the bobbin thread, it's because there's another piece of thread or lint or something in the bobbin area. One thing I want to add - if you're having issues with the thread on TOP of your fabric, the problem is with the bobbin thread. If you're having issues with the thread on the BOTTOM of your fabric, the problem is with your needle thread. If you're getting loops on the bottom, you need to check that your TOP thread is threaded correctly and is not catching on anything. My Daughter has a Brother machine she bought 6+ years ago from Wal Mart and she loves everything about it, except the small throat. She has a Brother 1500 with the 9" throat and really loves it because a queen sized quilt is much easier to quilt on. The first Brother cost about $170.00. She has gotten her moneys worth. I love my brother from walmart, take it to class every week, the SQ-9050. Not to mention in my class my machine sewed more beautiful buttonholes than some of the expensive machines. Inexpensive brothers are just fine for quilting needs. As for the refurbished ones, you really have to make sure they work right when you get them. 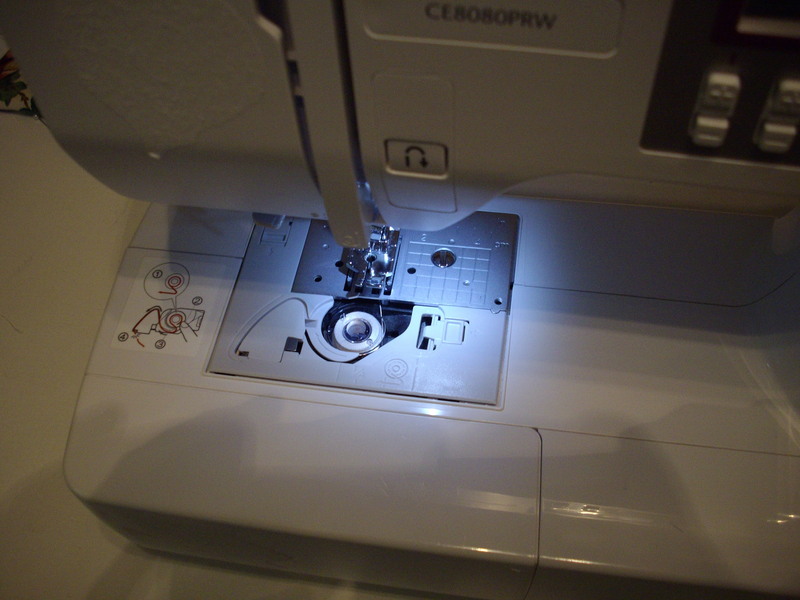 The first one I got of my xl-3500i was a lemon and wouldn't sew a thing, the company sent me a new one quick and six years later I still have it and it still sews beautifully and yes its another cheapie plastic brother. I packed it away for my daughter last fall. She loves sewing already and shes almost 3. I do have my expensive babylock thats made by brother but my little one can do most of the things my big one can and just as nice, the big one is just more heavy duty which will be good if I ever do sew for long hours more often. But as I always say for occassional quilters that do this as a hobby say weekends because they work and sewing is not their career to make money off of than the cheap machines are perfect for them.You only need an expensive one if you are sewing long hours every day causing more wear and tear on your machine. The same here except my little machine is closer to 10 years old. I have no complaints other than the small throat and also have a Brother 1500. My little machine will sew anything --- even reflective tape on miner's bibs. It sounds like there is just a problem with yours. Don't write off all the inexpensive Brothers because of one lemon. Also...listen for the little click it will make as you're pulling the thread through..it's very quiet..but you can hear it if you listen. What the other poster said about having lint under there can really mess them up, too is right on target. Does yours have the funny little black brush in the bobbin area? I have to clean it every now and then with a pin, it fills up with lint. That can cause the thread to mess up. I also hold the thread when first starting a seam. About 8 years ago, I purchased a Singer from Wal-Mart and it's been the best machine ever! My DH decided to purchase an older model machine in the cabinet, due to the price at a local auction. This machine doesn't like me at all...the bobbin is inserted from the bottom of the machine, and the tension will not stay where it's placed. I'm now using this one as a table. lol...but the cheaper Wal-Mart machine is still kicking out some awesome projects! There wasn't a book in the Wal-Mart box and I went back to ask for one which should have been included in the box. I was told to go out on a website and order a booklet. hah! I just couldn't part with such a great running machine! I have an expensive machine on my quilting frame -for my everyday sewing I also use Brothers from Walmart-have had no trouble out of any-when they lock up I just buy another. South East Michigan...at the bottom of the thumb! I agree! The pic shows the same as my machine. You don't pull the thread up. You just follow the diagram and you're good to go. I have a Brothers Project Runway CE-5000PRW that I paid around $160 for and use it for piecing all my quilts. I purchased it because I needed something portable to take to classes as my Babylock Ellegante embroidery machine was tooooo heavy. This little machine is a work horse. I've had it about 2 yrs and sew just about every day. I doubt I'll ever buy another $7,000 embroidery machine (cheap by todays new machines), but I'd sure not hesitate to buy another Brothers off the shelf at Walmart. Just MHO. I have a CS6000I and love it, never given me a problem. This is my third Brother machine. You should buy from a local dealer, so you warranty is good. Take it into a Brother dealer and see what they say. I got really excited about this advice, but alas, it is not working for me. This photo shows what happens 90% of the time, no matter what I try to do to set it up correctly, and shows how the thread is drawing from the wrong "part" of the bobbin (i.e., not crossing over). I can haul it to a Brother store once again, tho they did not sell it to me. Don't know what else to do.